What are Matching Top Curves? Matching top curves are special gold curved barbells. These typically have two large gems, one on the top and the other on the bottom of the barbell. The gems are generally the same in size so this is why the top matches the bottom of the barbell, hence the name. What are Double Navel Dangles? 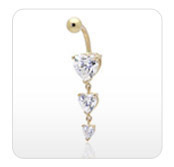 Double navel dangles are gold curved barbells that contain dangles in addition to the main gem. The main gem is generally positioned on the bottom of the barbell. There are typically two dangle gems with these barbells. These tend to be smaller than the main gem but match the main gem in shape and appearance.